I'm happy to be celebrating Mama Elephant's 2nd anniversary with a bevy of fabulous folks! Today is day 2 of a 3-day stampede full of fun, special discounts, and giveaways! I'm totally in holiday card mode, so of course I used the new Boutique Borders set to create a wintery holiday card:) The wide polka dot stamp in the set is perfect for creating falling snow! 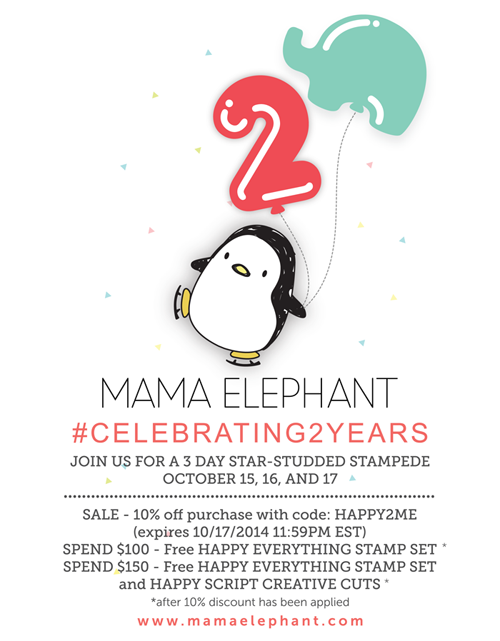 Just for the anniversary month, Mama Elephant is offering some special deals! - purchases over $150 will receive the HAPPY EVERYTHING stamp set and HAPPY SCRIPT die free. AND, as promised, there are giveaways! Mama Elephant is giving away THREE $25 gift certificates each day of the stampede blog hop, for a total of 9 winners. In addition, there will be exclusive prize giveaways on Facebook, Twitter, and Instagram. The winners will be chosen and announced on the Mama Elephant Blog on Monday, October 20th. You know the drill:) Comment on this post, comment on the Mama Elephant Blog, follow them on facebook and twitter for chances win! Thanks for stopping by! The next stop on the hop is the amazing Kathy Racoosin!!! I love the little carolers in a snowstorm! Absolutely gorgeous! So pretty! Love the vellum "snow", great card! How pretty, I love the snowy vellum overlay. The little carolers are sweet. Great card with the new release! Those cute carolers really look like they are in a snow storm! Very clever! So pretty! I love the stamped vellum for the snow - brilliant! I really think I need* that border set! Love the 'falling snow'. Such fun use of the vellum, JJ. Amazing card...I love the snow vellum layer. And those Carolers are so cute!! Love the vellum snow, looks fabulous!! How sweet, love the soft effect of the vellum, great idea! What a beautiful card, love the scalloped top! Beautiful and effective layering with that polkadot vellum! It makes quite the pretty scene! YEAH!! Welcome back to Mama Elephant!! I absolutely LOVE the scene you created!! So creative to stamp and color the alpine carolers behind the vellum panel! Those alpine carolers look awesome behind that vellum panel. Love the die cut sentiment panel as well. Loving the softness of this image! TFS!!! What a sweet, sweet card! I love that stitched border. I remember caroling as a child such fun memories I had forgotten, thank you for bringing it back! Such a pretty card! I love the vellum and snow! I love the vellum overlay! It really looks like a snow storm! Gasp! This is soooooo pretty. I love everything about this card! oH vELLUM AND SNOW jUST GREAT! Caps lock.... not so great! Love the effect of the snow on the vellum - stunning creation. Wow the vellum really makes it look like they are in a snowy scene. What a great idea.... Love the vellum snow storm! Those carolers are ao cute too! I love this stamp set. It's so unique. Layering the vellum was a great idea. thanks for sharing a beautiful card and an idea for a future card of my own. Excellent job! Love the snow storm on vellum! Absolutely gorgeous card! Love the vellum over the carolers, so cute! What an awesome idea to use the polka dot stamp for snow! This card is so cute! I love how you did the sentiment! Great card. I really like how you made them look like they are in a snow storm. Wow, I love the vellum overlay idea! Thanks for the inspiration. Completely adorable. The vellum is the perfect touch for the beautifully colored carolers. Oh, isn't that fun! I really like the snowy vellum overlaying the carolers. Very pretty card. Love the stitched top and the vellum overlay is so pretty. I so love the alpine carolers, which would make so many lovely cards, too cute. Sweet card, JJ! love the use of vellum. Love the falling snow - and the scallop die cut, a must have! I love that border and how you stamped the dots on vellum to create an overlay. Beautiful! Such a cute wintery scene for those cute carolers! Love the vellum technique! What a clever use of the vellum. Amazing as always. What a cute little snowy scene with the carolers. The vellum makes it look warm and wintery. Very cute card. Wow what a great and clever effect that vellum. Love your card. SOOO pretty! LOVE how u used the vellum! GENIUS! What a very fun card! Such a pretty card...I love the Swiss dotted vellum! I'm in love with that stamp set and sentiments--and what a cool idea to use dot stamp over vellum--this is so pretty! Very smart use of the polka dot border stamp and you lined it up perfectly!!! Love your snowy scene! The carolers are so adorable! Wow!! How lovely and elegant!!! Love the vellum idea, it's perfect. First glance of your card, I noticed the Botique Borders first. It's like the snow is being sifted from it. Pretty card. Love the dotted vellum piece on the front. Thanks for sharing. I love the border at the stop of the card and the vellum gives such an elegant effect! The stamped vellum makes the perfect snow storm. I love the way you did the snow on vellum. Awesome card. I love the effect of the vellum. Great inspiration!! Sweet snow on the vellum! Happy Anniversary to a great company, Mama Elephant!! Yay! I live your inks & big, bold sentiments! so fun, love the snow! Your card is soooo pretty!!! Such a cute and creative card! I love your snowstorm look with the alpine carolers, absolutely perfect! Such a sweet card--thanks for sharing! Love this card! It's so cute and kind of dreamy peaceful! Thanks for the idea of stamping the snow on vellum! It's perfect! Really like how you did your card. The carolers are just adorable. Cute carolers and your use of vellum - love it! What a clever idea to stamp on the vellum for snow. :) great effect! love that soft snow look! Very creative use of vellum to make a snow fall. I like it. 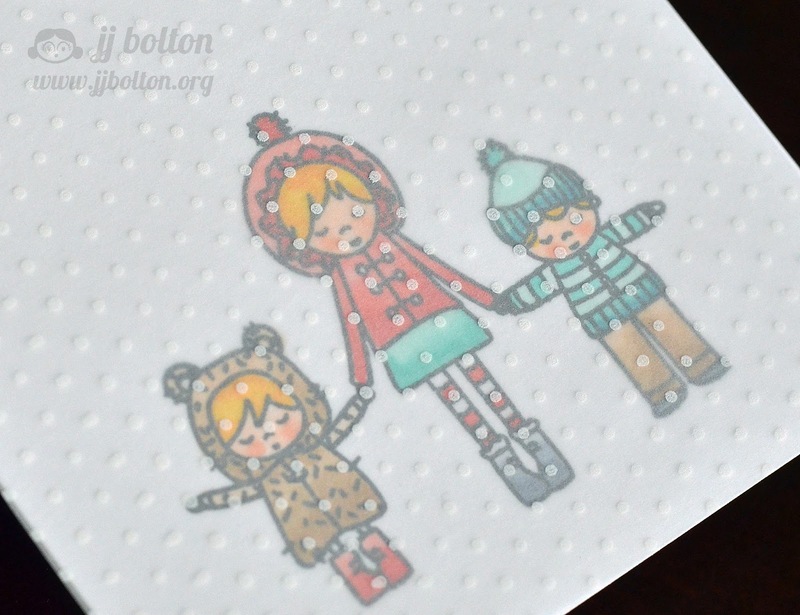 Sweet idea of using vellum to create the snowy effect! How clever! So fun! I love how it looks as if it's really snowing! What a fun card!!! I love the "falling snow" and the carolers are colored to perfection!! TFS! Such a pretty card. The carolers are so cute. That's a LOT of dots to hand stamp but it turned out gorgeous. I can feel the gentle snow falling with this card. It's simply beautiful. So sweet! And the vellum with snow is genius! Beautiful card. Love this card! I am obsessed with velum. so now another great idea for using it! Thanks, JJ! Love this and think your "carolers in a snow storm" is a wonderful idea. Not only is it clever but the card is just beautiful. Love the family in The snow! What an adorable card; love it!!! Such a cute card! Just adorable. JJ what an sweet card, lobe how you stamped the vellum! Love your "snow storm" on vellum. Did you use the boutique borders for stamping the dots? Love the little carolers and your card is beautiful! The stamping you did on the vellum is gorgeous...I thought it was pre-printed vellum! The raised clouds also really make this card! I love your idea of using the polka dot vellum over the images. It really gives that feeling that snow is falling! Adorable! Going to have to try the vellum technique! What a great idea to use the polka dot border as snow! The caroler figures are so cute. Your coloring really made them shine. Vellum is making a comeback. It really works on your card. Thanks. Wow! The snow effect you achieved is great! I'm definitely going to try that! The Carolers are sooo cute! I love the idea of the vellum snowfall. oh wow, i really like the snow effect! Your card is quite lovely. Great card and I love the snowy effect vellum gives it. Cute card and a great idea!! I love your coloring. It seems a shame to cover it up, but it really does look like a snow storm. The snow is awesome! so clever! Love the look you got with the snow! Oh my goodness!!! This is absolutely precious!! LOVE LOVE LOVE it! Love the winter snow storm scene! I think you achieved the look. Love it! How clever to mimic snow by using vellum. Oh wow love the card and the idea! 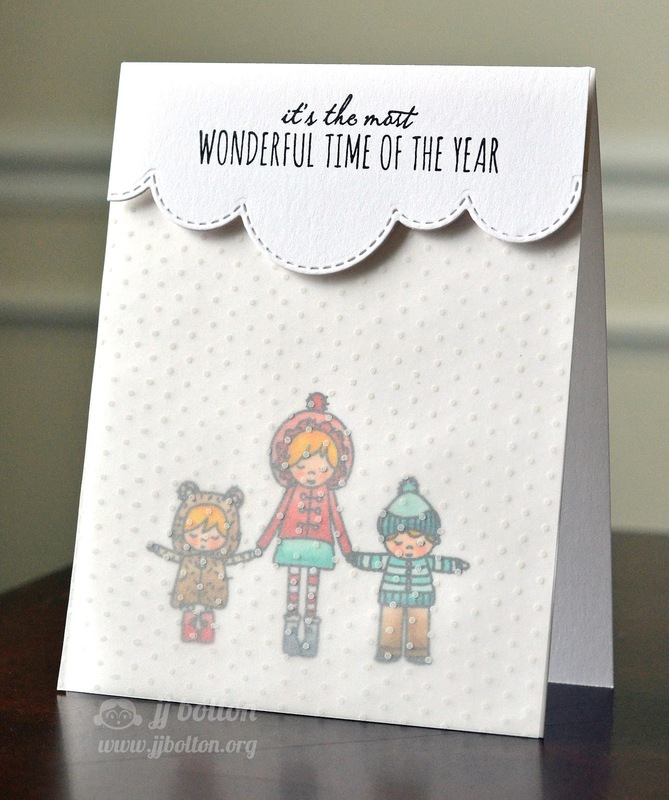 That is such a sweet card and I love how you used the background stamp to create snow. Just precious! Probably my favorite mama elephant set...love these little people and the snowy setting is beautiful! Wow! What a beautiful card! It´s really sweet! Aww your card is super cute! I didn't order this stamp set and totally love it! This card is so pretty! I love the soft touch the vellum overlay offers! Love the vellum touch. So soft. Love the vellum on the top..
Adorable card. It does look like a snow storm. I love your use of the vellum in this card. So pretty! Love the vellum snow! Great idea! I love how you used the vellum as the snow. That is a great idea!! Very creative use of vellum to make a cute card! Very very clever. Thank you for the fab idea. Your card is amazing. I am usually not a pick fan of people stamps but these are very cute! Your card is just lovely! Love the depth with your layering. The carolers are so cute - love your pretty card! Sweet card! Love that snowflake look and the darling stamps! Your card is lovely and the stitched borders add so much - love the snow too! Thank you so much! Such a lovely card! Love the effect of the stamped vellum! Really does look like snow. Great effect! Love it! Love the touch of vellum too! Oh, I love this card! Cool snow idea! Very clever use of the vellum to create the appearance of carolers in the falling snow. Really great card, JJ. I just love these little alpine carolers, can't wait to add them to my cards! Love the look of the "snowfall" over the top! Such an inventive and creative way to create a snowy wintery scene! Love the snowstorm you created for the carolers. I love how you made the snow scene, so creative! Those carolers are darling. Brilliant use of vellum to recreate falling snow. Love it, thanks for sharing this incredible card. Cheers! So fun watching you create this card! Love Elena's set and the 'snow falling'. The snow effect is wonderful! Great card! Sweetness! Love the polka dot vellum. Clever idea for the snow! How cute! You are right, the kids are more than adorable! Love the vellum! Great job! love the vellum with white dots as a snow storm~ brilliant! Beautiful card! Love the vellum. So beautifully colored and love how you made it snow! Lovely card, J.J.! Love the snowy effect. Happy birthday mama elephant. Thank you for chance to win. Those alpine carolers are a hearty lot out singing in that snow! Love those new border dies. How darling! Your idea of the carolers being in a snowstorm--fabulous! It turned out beautifully! I love this stamp set!!!! Your card is adorable I really like how you did the falling snow.